Sure, you can still buy albums one at a time, but music streaming services offer up a ton of music options, with millions of songs available on demand, plenty of ways to find new music, and digital radio stations curated by top DJs or automatically generated based on the music you like. Since you can get that all for less the cost of a single album, it's hard to say no to today's streaming services. But there are a lot of services out there, which make it tough to decide on the best service for you. To help you pick the right place to stream your music, let's run down what you need to know about streaming music and the best (and most popular) streaming services. By the time we get to the end of this article, you'll know which service is right for you. Major streaming services have between 30 and 56 million songs, but you won't find every song on every service. Both Tidal and Apple Music like to tempt listeners with exclusive tracks. On-demand streaming of whatever you want to listen to (as long as it's part of the service's library). 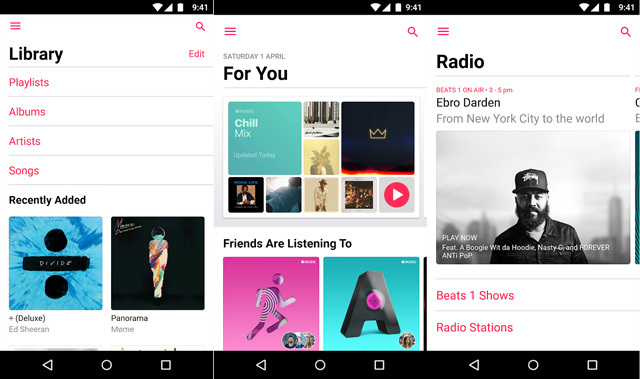 Radio-style stations, either with live DJs (like Apple Music's Beats 1) or automatically generated based on what you enjoy (like Pandora). Music downloads for offline listening, so you aren't tied to an internet connection for all of your music. You'll have the ability to listen on any device, but it's important to pick the service that works best with the gadgets you have. Most cost around $10 per month, though some offer a free tier if you're willing to listen to ads. There are often discounts for families or students, and sometimes you can bundle to save — for example, you can get access to Spotify and Hulu for just $13 per month. And now that you know the basics, let's take a look at what each of our favorite services does best. Spotify is the gold standard of music streaming services. It has everything you need and it doesn't make any demands of listeners. You can even listen for free as long as you're willing to put up with advertisements. The free tier has access to all of Spotify's 40 million songs, but can't completely control how you listen to them. Free users can only shuffle through most music — and can only skip six songs an hour. That may be okay for people who are fine picking a playlist and listening, but if you want more control of your music, you'll want to update to Spotify Premium. Premium costs $9.99 per month (or $14.99/mo for families or $4.99/mo for students), which is what you'll pay for most streaming services. For your cash, you get ad-free listening, better audio quality, voice playback on Google Assistant and Alexa and the ability to play any song you want and download songs to your mobile device for offline listening. Like we said: it's everything you need. But the big selling point of Spotify is that it can play music on almost any device. No matter where you go, Spotify can go with you. Beyond the standard desktop and mobile platforms, Spotify works with smart speakers from Sonos, Bose, Amazon, Google, as well as smart TVs, video game consoles… and almost any smart home device with a speaker. It also works with every voice assistant except Siri, and Siri support is coming with iOS 12 — so Spotify will work with all of the major voice assistants. That means you don't have to match your electronics to your streaming service. Like many of Apple's products, Apple Music is perfect for people already using Apple products… but a bit shoddy for anyone else. It primarily works with Apple devices, though Windows users can listen on desktop via the rather clunky iTunes interface and there is a decent Android app, though no Siri. It's no surprise that Apple Music is tightly integrated with Siri, so when you say "Hey Siri, play music," it plays from Apple Music and only Apple Music. 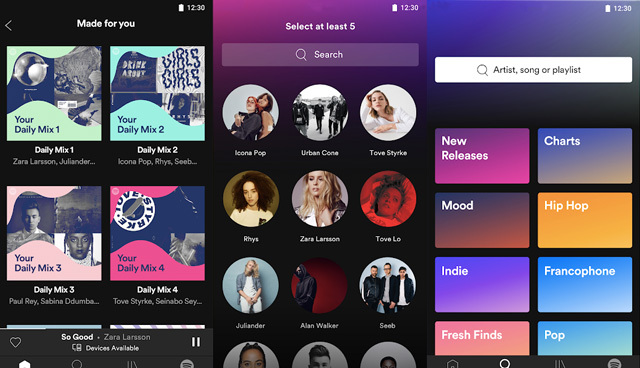 Support for third-party streaming services is finally coming with iOS 12, but it still won't have all the features of Apple Music. Fortunately, Apple Music is a great streaming option, so Apple fans aren't missing out. With over 45 million songs, it has more tracks than most of the competitors, and it offers great ways to discover new music. The Beats 1 channel offers 24/7 radio programming, hosted by DJs and performers including Dr. Dre and Elton John. Every day it offers you a new selection of music it thinks you'll like based on what you like listening to, with an eclectic range of artists and playlists, some of which are curated by hand and some of which are generated by an algorithm. Whether you have a particular artist in mind or you just want to browse, there's always something to listen to. One unusual feature is iTunes Match, which can be handy for people with existing music collections. With Match, your entire music collection is stored on the cloud so you can get to it from anywhere. It costs $25 per year no matter how big your library is, and you can access everything through iTunes or your Apple Music app. This can be a great companion to a streaming music service. Price-wise, it's in line with other services at $9.99/month, with a family subscription for $14.99/month and a student plan for $4.99/month. You won't find any discounts, but Apple offers a generous 3-month trial so there's no reason not to check it out. Pandora is a little different than the other streaming services. Instead of letting you listen to exactly what you want exactly when you want it, you give Pandora a song or artist you like, and it will play other music you'll like. Pandora touts its Music Genome Project, a comprehensive study of music that lets it tailor radio stations just for you. As you tell it which songs you like, it learns and improves your stations. If you need to be in control of everything you listen to, Pandora isn't for you — but if you just want to press play and walk away, it may be perfect. It's Pandora's smart radio stations that stand out. 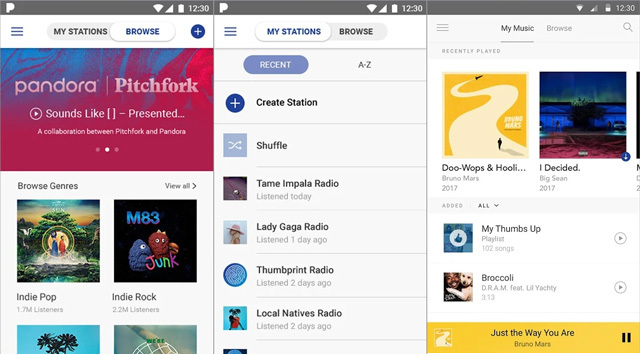 While other services offer plenty of playlists — including playlists that are automatically generated, like Pandora's — it's still Pandora's specialty. If you like the idea of a streaming service that plays music you like without a lot of effort on your part, Pandora is the service for you. Tidal is a streaming service made by musicians for music-lovers. It's owned by artists, including Jay Z, Beyoncé, Rihanna and other big names. And with so much musical talent involved, it's no surprise that Tidal cuts down the barriers between performers and fans. 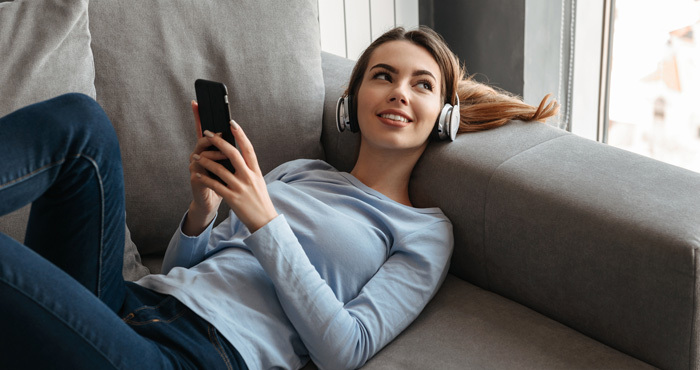 It offers the largest catalog of any streaming service with over 56 million songs, and it has the features you would expect from a modern streaming service: on-demand ad-free streaming, curated playlists, and music discovery. But it's the details that make Tidal something special. Subscribers have access to exclusive events, like livestreams, concerts and other events (both online and offline). Tidal is also the first streaming service to get a lot of big-name musicians — like the aforementioned Jay Z and Beyoncé — though these exclusives may only last a week or two. 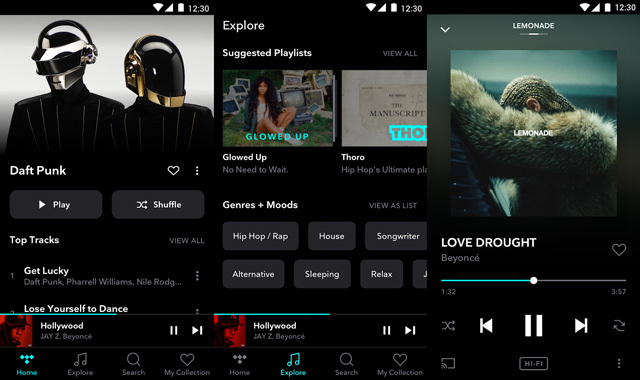 Pricing starts at a standard $9.99/month for music and exclusives, but another thing that sets Tidal apart is its music quality. Tidal is the only service that offers completely lossless, CD-quality music for crystal-clear listening… though it comes at a cost. That lossless audio comes with Tidal's HiFi subscription which will set you back $19.99/month — twice as much as most other streaming services. But for serious audiophiles, it will be worth it. Amazon Music Unlimited has all of the basics and supports a bunch of different streaming devices (though not as many as Spotify). It has song library that Amazon says features tens of millions of songs and has been estimated to be 40 million, which makes it comparable to Spotify. The plans get complicated. The basic individual plan costs $7.99/mo for Prime members or $9.99/mo for non-Prime members. That's a good deal if you're already a Prime member, but an average price if you aren't. Student plans also cost a perfectly average $4.99/mo. The Family Plan is $14.99/mo for all subscribers, but only Prime members have the option to pay annually, which gives them a discounted rate of $149/year. The plan itself is pretty nice, though, offering six individual accounts, each with its own personalized music library, playlists and recommendations. Alexa devices — like the Echo you keep in the kitchen — can even recognize who's speaking and pull up their personal playlists. Amazon also offers a couple of budget options which may make sense for you. Prime Music offers 2 million songs and is included in your Prime membership — so if you're already paying the $119/year for Prime and you're okay with a limited library, you have free, ad-free music streaming. Or for $3.99/mo, you can stream to a single Echo or Fire TV device. And that's not just one stream at a time: you can only stream to one device. It's extremely limited but could be reasonable for an Echo in your living room. Amazon Music Unlimited is a good choice for Amazon Prime subscribers, who can get all the music they want for a slightly lower price than the competition. Anyone with a reliance on Echo devices will also find the service compelling because it can be easily controlled with Alexa. (Spotify works with Alexa, but most streaming services don't.) For anyone who already uses a lot of Amazon gadgets, Amazon Music Unlimited is a streaming service that's perfectly good — just don't expect any standout features. There's a good chance you've listened to music on YouTube. Before streaming services were a big thing, it was easy to head to YouTube, search for your favorite song, and find official videos, fan-made videos, cover songs and a lot more. 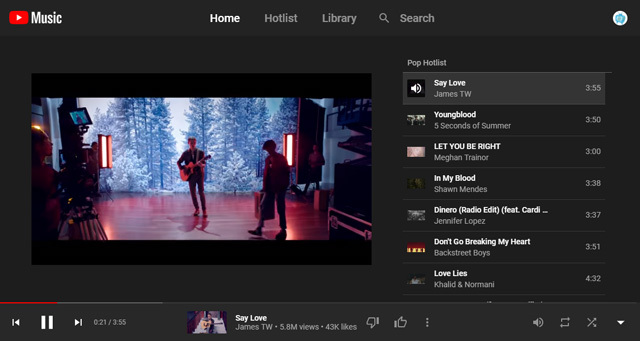 YouTube Music aims to make it easier to find the music you want by combining the music you could already find on YouTube with licensed tracks from music labels. While YouTube doesn't list a number of songs on the service, it's in league with its competition — and on top of officially licensed tracks, it can give you all the variety YouTube has to offer. You have two listening options: a free option with ads or a $9.99/month Premium option without ads, with a $14.99/month plan for families. That makes it similar to Spotify and Pandora… but it's not quite as well developed. The interface is rather basic. It has three simple tabs, with few options in each: Home suggests music you might like, Hotlist shows you popular tracks, and Library holds all of your saved songs. Whatever you click on sends you to what looks like a standard YouTube playlist. Like we said, it's pretty basic. You may enjoy this streamlined interface, or you may want more tools to organize, discover and browse music. What about how Tidal being driven into the ground. With Jay Z being sued by Kanye, and customers accounts reactivating and being charged as full accounts, just to boost their sales and justify their existence to their backers. I’ve had a stressful experience withTidal - to say the least. I can attest to your comment. You are absolutely right. They operate in shady dealings. At times I think they may be holding on by a thread in the streaming service market and they carry out less than legal tactics to appear to stay afloat. I’m sure every new company has had to pull a few strings here and there to make it in the beginning without judgement, but when your tactics affect their customers/clients then it sends a strong message that they really don’t care about their customers at all and are willing to throw them under the bus to stay afloat. It’s a great idea, platform and could potentially be a goldmine, but the inner workings are corrupt and leaving a bad tase in the customers mouths. There you have it. I would also mention www.beatsense.com as the option for the lazy / social listeners. As it crowd-driven auto music algorithm seems to outshine them all. don’t really care about the quality of music since I listen to it while at work and can hardly spare the time to appreciate how good or bad it sounds over the sound of bashing the keyboard. I couldn’t give a damn about indie newances since they are mostly crap anyway, custom-made to adress certain ethnic or sub-cultures to pay for their tickets. Their careers last for just about as long as their “hit” tracks. Finally, the ammout, no matter how overwhelming since it’s impossible to listen to all of it anyway. I just want the services to allow me to export my playlists, so each time I find something good to listen to at work I don’t have to write the name down and find it on my workstation. I found https://freeyourmusic.com to move my tracks around, but why should I rely on a third party program when those apps are supposedly made for me? Lol, you are obviously not a musician! If people don’t pay musicians for their hard work involving years of practice and dedication, then of course they will have short careers! If you are paying for the service - you should be allowed to export your playlists, or at the very least, some songs off of your playlists. I’d be willing to pay a little extra to a streaming service (if that were an option.) to export my playlists. As long as I’m paying for the service every month, why can’t I export the songs??? If I ever decide that I want to discontinue my service? - no more exporting. Simple. Another option that would be great is the option to permanently purchase your playlists if you decide to discontinue your streaming service. It all sounds a little complicated but I know SO MANY PEOPLE that share this same issue with us. What do you mean by "export"? 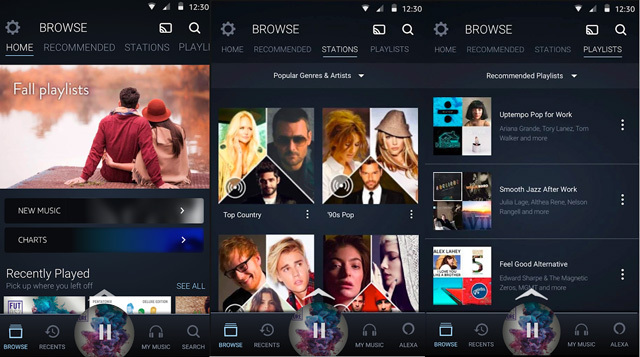 Most (all) of the streaming services allow you to download songs from your playlists for offline listening through the service’s app. And you can login to the service and access your songs and playlists on any device (e.g., use Spotify via your browser on your work computer to save songs and it will sync with the Spotify app on your cell phone). What Spotify won’t do is allow you to purchase the songs for permanent access if you discontinue your subscription, but Apple Music, Google Music, Amazon Music all offer music purchases if you want to go that route rather than paying for monthly streaming. The problem with Spotify, iTunes and others is that the musicians who generate all this content get next to nothing. Sell a million copies of a song? Receieve maybe $16. BANDCAMP is the better alternative if you want to support musicians and thier artistry. They get the majority of the the money you pay for downlaods, merch, and physcial copies of their music.You can pre-listen before you buy and you can stream anything you have purchased at any time. There’s great new music daily, often curated by experts, and best of all it’s free to join and access. Thanks! I’ve never heard of it before. Can’t wait to try it outs. I wonder how big the library is. Also, the artist has the option to opt out of allowing their music to be played in a streaming service. It must be profitable in some way that makes it worth it to them if they are slowing their music to be streamed??? Remember when Taylor Swift pulled her music from Spotify and sued them ? She set the new standard for what artists get paid in exchange for their music being streamed.